Use of the One Biosecurity portal (onebiosecurity.pir.sa.gov.au) is governed by the following terms and conditions, which when accepted, constitute an agreement between you and the South Australian Government (including its agents, employees and subcontractors). Use of the One Biosecurity portal indicates and is conditional upon acceptance by you of the following terms and conditions. The terms and conditions of the myPIRSA portal form part of these terms and conditions and apply to the One Biosecurity portal as if all references to ‘myPIRSA’ were references to ‘One Biosecurity portal’, unless otherwise specified. You agree to the terms and conditions of the myPIRSA portal. We may amend the terms and conditions at any time, and we will notify you of any changes. You agree that all information you provide to us including on the One Biosecurity portal is true and correct. attending at any premises to which your account relates (livestock producer account holders only) and undertaking activities to assess the accuracy of claims made, such as inspecting stock, fences, farm records, etc. You agree to produce any evidence requested by us to verify the accuracy of any information provided by you. We may edit, refuse to post or remove any information and/or materials provided by you through One Biosecurity that we consider is in any way inappropriate, including any false or misleading information. You agree that any information that is made ‘public’ within your One Biosecurity account will be able to be accessed by other account holders. We may use any information provided by you in statistical or similar form that could not be reasonably expected to identify you for reporting purposes, including providing such data to third parties to support market access requirements, for research purposes or for general health reporting. We may remove from any property any sign or notice that contains any information obtained from or referring or relating to the One Biosecurity portal if we consider that action to be appropriate. You must maintain an active myPIRSA account and an active Property Identification Code (PIC), where appropriate. Only you, the account holder, may view and update your account. You are responsible for keeping your account login details secure. You must not disclose your log in details to another person. 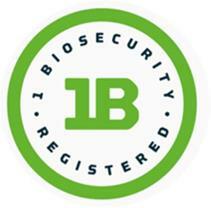 Livestock producer account holders will be eligible to use the 1B motif (logo) and approved imagery to promote and share information regarding their One Biosecurity status, but it must be used in accordance with the guidelines and respecting the premise and values of the One Biosecurity program. We may suspend or revoke your account if you breach any of these terms and conditions, including the terms and conditions of the myPIRSA portal, or if you commit a criminal offence. Prior to taking such action, we will give you such notice as we deem fit in the circumstances. The Government of South Australia, its agents, instrumentalities, officers and employees give no warranty and make no representations, express or implied, as to the accuracy, completeness or fitness for purpose of the information and data contained on the One Biosecurity portal. Use of the information and data contained within this site is at the users sole risk and if you rely on the information on this site you are responsible for ensuring by independent verification its accuracy, currency or completeness. The Government of South Australia, its agents, instrumentalities, officers and employees accept no liability however arising for any loss resulting from the use of the site, any information or data contained on the site, or reliance placed on it (including translated information and data).